Across the thousands of Islands of Indonesia, there are vast styles of traditional housing that embody their local culture and beliefs. As modernity creeps into rural Indonesia these dwelling have been adopted to the changing lifestyle of their inhabitants. Sumatra a northern island of Indonesia’s is home to the Batak Toba people, situated on an; in land volcanic island on Lake Toba. There are six separate Batak ethnic groups, of which two are Islamic and four christian, although they all still embrace their ancient traditions and beliefs. At a local level, the Toba people live in small traditional villages called a ‘Huta’. All the people that live a Huta, are from the same family clan. 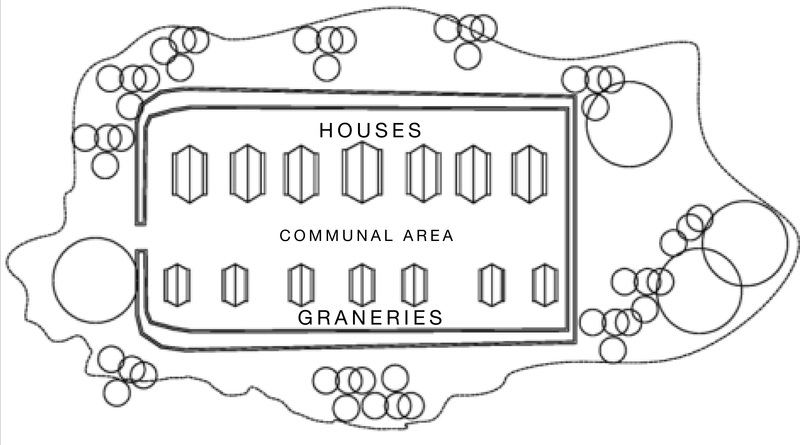 A Huta generally consist of Houses, Granaries, a large community meeting area and an outer wall, see fig 1. 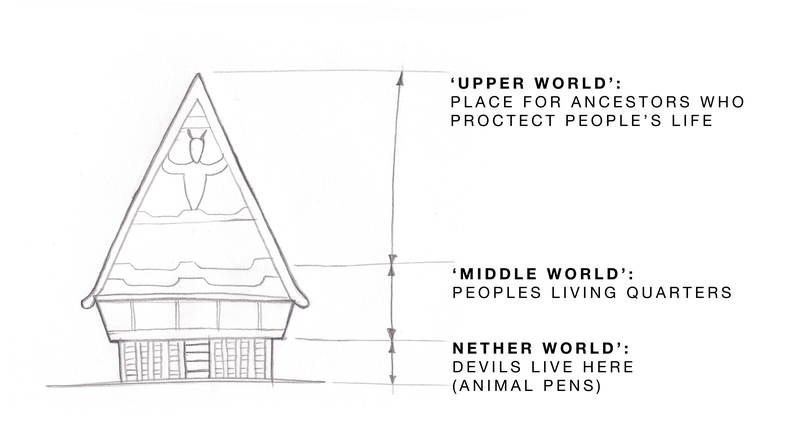 The Traditional Batak Tuba house has three level, each intended for different uses (Fig 2). Traditionally, these housed approximately 4-6 families that were all related by marriage. Inside the house is one large communal room in which each family has its own area. At night these areas are partitioned for sleeping by Batik cloths. When entering a traditional house you will notice a lower than average door that you will have to duck under, this also ensures one must bow out of respect. Fig 2: Layers to the traditional Batak Toba house. However, in recent years these houses have undergone varying levels of modernisation due to ‘repatriates’ returning from city areas, possessing new concepts on “privacy and physical comfort…” (Hanan 2012, p.809) inside the house. This has resulted in often only one family inhabiting a dwelling, in adittion to new dedicated living and bathing spaces, generally resulting in an extension at the rear of the original dwelling. These new dwelling, generally use ‘new’ material types such as masonry and corrugated iron, with a western aesthetic. As the houses transform, so does the culture, “…inhabitants feel fashionable and well off having a room for entertaining…” (Hanan 2012, p.810). This is in stark contrast to traditional culture of a Huta, were communal events took place in the middle of the ‘village’. Meanwhile, a monetary value system has forged new values, the contrary of tradition; using favours, privileges and kinships instead of money. As seen, a changing lifestyle has the consequently led to a cultural change of the Batak Toba people. How do you feel about a remote tribes moves to modernise? DesignersAtelier 2014, Traditional House of BATAK TOBA – Samosir Island, North Sumatra, INDONESIA, viewed April 29 2015, <https://www.youtube.com/watch?v=F6VvMkITHgc>. Hanan, H. 2012, ‘Modernization and Cultural Transformation: The Expansion of Traditional Batak Toba House in Huta Siallagan’, Procedia – Social and Behavioral Sciences, vol. Vol.50, pp. 800-811. Ministry of Tourism, Republic of Indonesia The Batak Toba Village and Traditional Houses, Indonesia, viewed April 29 2015, <http://www.indonesia.travel/en/destination/48/the-incredible-lake-toba/article/160/the-batak-toba-village-and-traditional-houses>. It’s interesting how the traditional Batak Tuba houses 4-6 families, which i’d imagine would create a strong bond between the families, forming a community of some degree. I wonder if there is any difference in cultural perception, social habits when compared to Indonesians that live in a more modern setting with only one household.